SAN DIEGO — As thousands of migrants in a caravan of Central American asylum-seekers converge on the doorstep of the United States, what they won’t find are armed American troops standing guard. 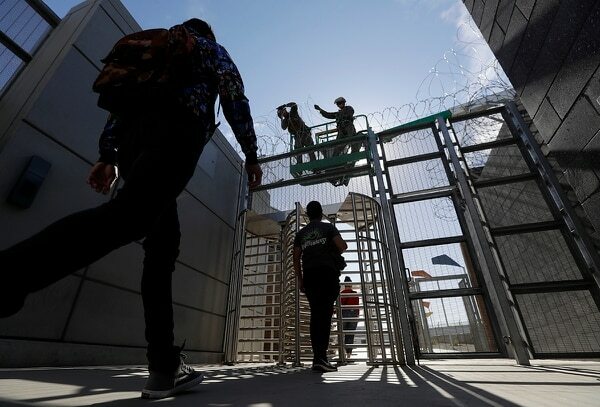 Instead they will see cranes installing towering panels of metal bars and troops wrapping concertina wire around barriers while military helicopters fly overhead, carrying border patrol agents to and from locations along the U.S.-Mexico border. That’s because U.S. military troops are prohibited from carrying out law enforcement duties. The president said troops could fire on migrants who throw rocks. But the unit-level ROEs are more complicated. What's more, the bulk of the troops are in Texas — hundreds of miles away from the caravan that started arriving this week in Tijuana on Mexico's border with California after walking and hitching rides for the past month. Still, for many migrants the barriers and barbed wire were an imposing show of force. 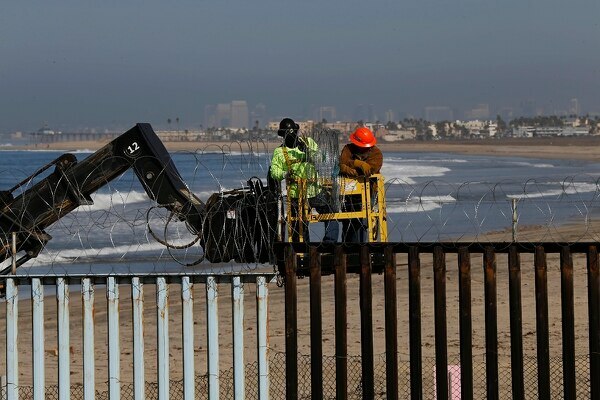 Angel Ulloa stood on Tijuana's beach where a wall of metal bars more than 20 feet high cut across the sand and plunged into the Pacific. He watched as crews on the U.S. side placed coils of barbed wire on top. A border patrol agent wearing camouflage and armed with an assault rifle — part of a tactical unit deployed when there is a heightened threat — walked in the sand below where the men worked. A small border patrol boat hovered offshore. "It's too much security to confront humble people who just want to work," said Ulloa, a 23-year-old electrician from Choloma, Honduras, who joined the caravan to try to make his first trip to the U.S.
Now, he and his two friends were rethinking their plans. They tried to apply for a job at a Wal-Mart in Tijuana but were told they need a Mexican work permit. So they were considering seeking asylum in Mexico but were unsure of giving up their dream of earning dollars. "We're still checking things out," he said. 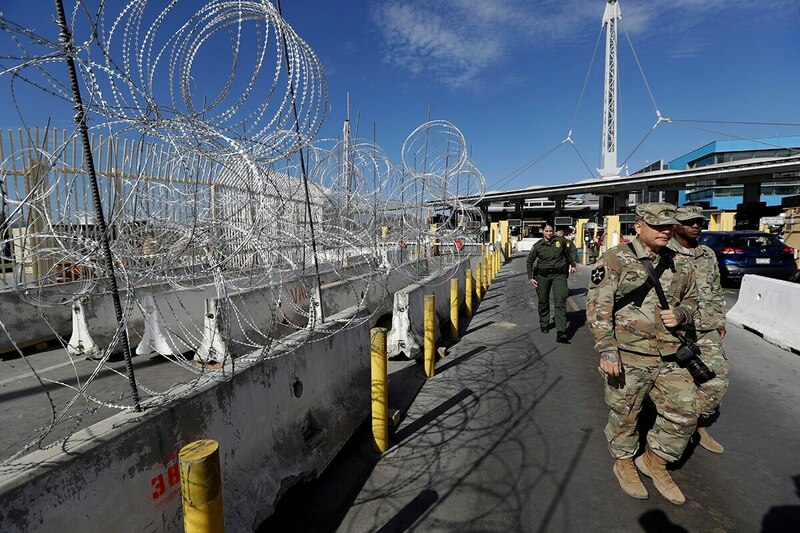 On Friday, people walking through one of the world's busiest border crossings into Mexico passed by a pair of Marines on a 20-foot lift installing razor wire above a turnstile. Nearby Army Sgt. Eric Zeigler stood guard with another soldier. Both were military police officers assigned to protecting the Marines as they work. The 24-year-old soldier from Pittsburgh spent nine months in Afghanistan. ""It's very different over there, obviously. It's a lot more dangerous," Zeigler said. He said he was surprised when got his deployment orders sending him to the U.S.-Mexico border. "But I'm happy to go where I'm needed" he added as a man walked by carrying shopping bags headed to Tijuana. The U.S. military has deployed 5,800 active-duty troops to the U.S.-Mexico border. So far, more are not expected, despite President Donald Trump's initial assessment that 10,000 to 15,000 were needed to secure the border against what he has called an "invasion" of migrants. Most in the caravan of several thousand are families, including hundreds of children. The number of U.S. active-duty troops deployed to the U.S.-Mexico border has “pretty much peaked” at the current total of 5,800, the Pentagon’s No. 2 official said Thursday. Another 2,100 National Guard troops are have also been deployed since April as part of a separate mission. Like the military troops, they are not allowed to detain illegal crossers. Instead, they have been monitoring cameras and helping to erect barriers. Of the 5,800 soldiers and Marines, more than 2,800 are in Texas, while about 1,500 are in Arizona and another 1,300 are in California. All U.S. military branches, except the Coast Guard, are barred from performing law enforcement duties. That means there will be no visible show of armed troops, said Army Maj. Scott McCullough, adding that the mission is to provide support to Customs and Border Protection. "Soldiers putting up wire on the border and barriers at the ports of entry will be the most visible," he said. Marines and soldiers share the same duties in California and Arizona. These include erecting tents, setting up showers and arranging meals for troops working on the border, and assigning military police to protect them. There are no tents or camps being set up to house migrants, McCullough said. Medics are on hand to treat troops and border patrol agents — not migrants — for cuts, bruises and any other problems. Combat engineers — whose duties on the battlefield include setting up tactical obstacles to prevent the enemy from moving freely — are using their expertise to string wire on border walls and erect temporary fencing, McCullough said. Construction engineers have been assigned to weld together barriers and move shipping containers to act as walls. 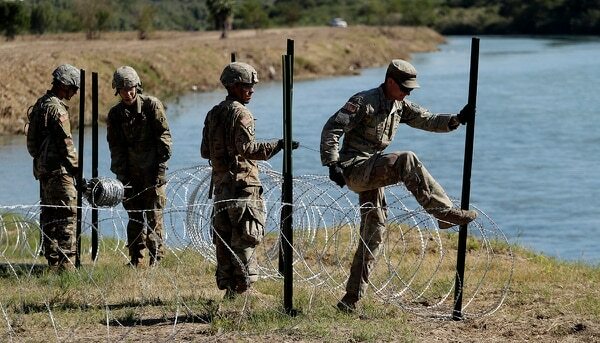 In Laredo, Texas, about 100 soldiers have been installing three layers of razor wire along the Rio Grande, working on the banks during the day and on the bridges at night to minimize the disruption to cross-border traffic. The current mission is scheduled to end Dec. 15 for now. It's unclear how much it will cost and military leaders have refused to provide an estimate. Critics have questioned the wisdom of using the military on the border where there is no discernible security threat. Since the Nov. 6 elections, Trump has said little about the matter and no border threat has materialized. Some border communities fear the barricades will scare off Mexican shoppers. The city council in Nogales, Arizona, slashed a proposed bonus for all employees in half over concerns about how the military's presence would affect its sales tax revenue after the military closed off two lanes at its border crossing. The Pentagon says it will stop using the operation name for the U.S. military mission on the southern border. Defense Secretary Jim Mattis defended the deployment during a visit to the Texas border this week, asserting that in some ways it provides good training for war. Suyapa Reyes, 35, said she was puzzled as to why she would be seen as a threat. Reyes, her mother, 12-year-old daughter and 16-year-old son left Honduras with the caravan on Oct. 13, fleeing violence and poverty in her hometown of Olanchito de Oro. She does not want to return after coming such a long way but if she cannot get asylum and the border looks too dangerous to cross, she said she'll have no other choice. "I'm not going to risk my life or safety nor that of my children," she said. This story corrects the spelling of Army Sgt. Eric Zeigler’s last name. It is Zeigler, not Ziegler.